The first truly portable stand-alone analyzer with a patented rugged FTIR spectrometer for high-speed lubricant oil condition monitoring in full compliance with ASTM, DIN and JOAP methods. With its lightweight build and compact footprint, it is a welcome addition to mobile laboratories to automatically deliver a detailed finger-print of used oil on-site and check for degradation and contamination within seconds. ERASPEC OIL is the first truly portable stand-alone FTIR oil analyzer on the market. It is the ideal solution for on-site measurements, as it provides immediate feedback about the status of the oil also in remote areas, where avoiding equipment breakdown is most critical. With its compact (weighing just 8 kg / 17.6 lb) and rugged design (full metal housing) the ERASPEC OIL brings lab quality results to the field. 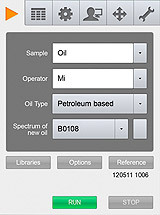 Its built-in industry PC and the large full color touch screen allow the direct display of the oil spectra as graphic chart. Like this spectra can immediately be analyzed and compared with other spectra, as several thousand spectra can be saved in the internal instrument memory. *) These properties are calculated based on a database using Multi-Linear Regression (MLR) and Cluster Analysis. The range and repeatability depend on the database used! All eralytics analyzers use an intuitive menu structure that is easy to navigate. Samples need no prior preparation and measurements are done fully automated. The results are displayed immediately after the test on the large and user-friendly color touch screen. The internal memory holds thousands of measurement results. For convenience, data can be directly saved to USB memory sticks for further processing or a thorough analysis. The data format is compatible with most PC spreadsheets, such as Microsoft© Excel. Customized print-out designs are available for easy direct printing. 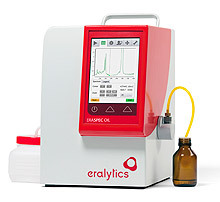 All eralytics instruments are compact stand-alone analyzers with a built-in industrial PC. They represent the latest in technology, designed for longterm, maintenance-free operation. 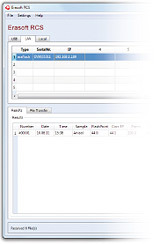 Of course, all eralytics analyzers use cutting-edge industry technology and provide universal data transfer options. Ethernet and USB interfaces allow advanced data management and connectivity to PCs, modern printers, keyboards, PC-mice, barcode readers, or other external equipment. A direct out-of-the-box connection to LIMS (Laboratory Information Management System) is established with a standard Ethernet cable. No extra software or PC is needed. The small footprint of the eralytics instruments makes them the first choice for use in the lab and on-site. Lightweight and built with an integrated carrying handle they are ideally suited for mobile applications. Data are stored safely in the large results memory, which holds many thousand records. Six user levels and a state-of-the-art password technology protect your test result data from accidental deletion. At the push of a button, firmware and software updates can be downloaded from the internet. The internet connection also allows to remotely control eralytics analyzers or to perform standard service activities. Due to continuing product development, specifications are subject to change. All eralytics products are manufactured under ISO 9001 regulations and are CE compliant.